The New Mutants are a sort of young X-Men. These teenage mutants were recruited by Professor X when the X-Men were thought dead. This Marvel comic books series ran throughout the 1980s. To find young mutants and train them to control their powers so that they are not a danger to themselves or others. The New Mutants are teenagers residing at Professor Charles Xavier’s School for Gifted Youngsters in Salem Center, NY. To the outside world, Xavier’s is an elite boarding school open only to the most gifted students. In reality, those gifts are their mutant powers. Students split their time between classical academic studies, extensive physical conditioning, and training sessions in the mansion’s Danger Room. At this stage the New Mutants are explicitly not “X-Men in training”. Xavier’s intention is that they are to be students, not super-heroes. In the beginning this is because Xavier believes the X-Men have been killed by the Brood. Though he concedes that young mutants still need a teacher, he does not intend to make them into X-Men and see more of his students die. 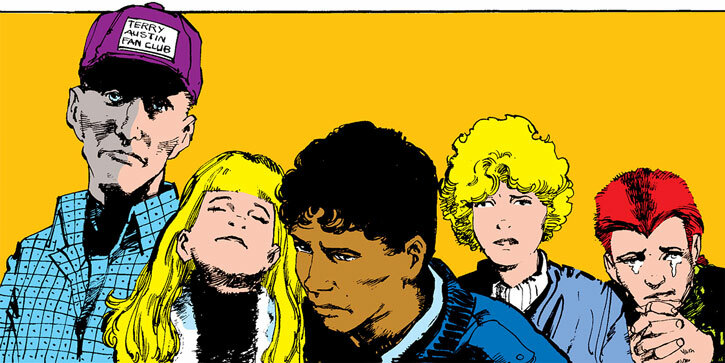 Even after the X-Men return safely, Xavier remains determined to keep the New Mutants students; “they do not go on missions”. However, mutants are targets by nature. 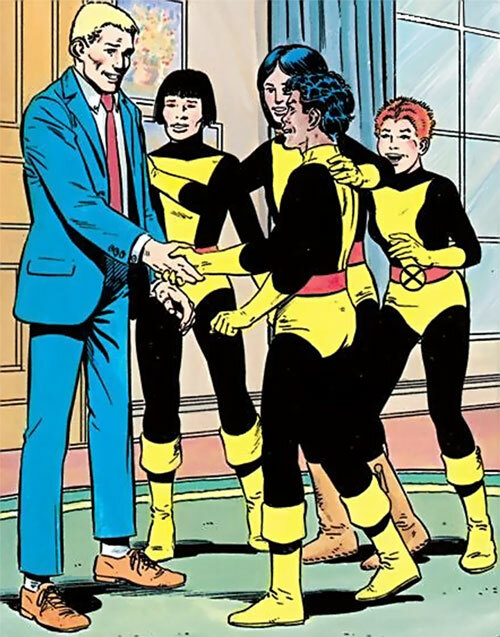 In just their first three appearances, the New Mutants have already been targeted by the Hellfire Club (both the renegade Donald Pierce and the Inner Circle led by Shaw/Frost), the Brood, and the U.S. government’s Project Wideawake. So their Danger Room sessions do include both individual and team combat training. Acrobatics, hand-to-hand training such as judo, and offensive and defensive uses of their powers are all covered. Though they are told, again and again, to stay away from trouble, they are as courageous as the X-Men. So they often disobey and follow their hearts into danger. This often helps trouble to find them. They are in a rebellious period of their lives. With the overconfidence superpowers bring to your average teenager, they often end up in situations way over their heads. With the help of Magik (Illyana Rasputin), they can reach any location on Earth or beyond. They have visited Asgard and deep space somewhere within the Shi’ar Empire. To help Illyana, or take advantage of her enhanced magical influence there, they often visit Limbo. When Illyana’s control of her teleportation disks fails, it can land them in the past, such as Scotland in the Middle Ages, or in alternate future time-lines as well. They go wherever studies (Downtown Salem Center), family matters (Brazil with Sunspot), or duties (Muir Island to visit Dr. MacTaggert) take them. Once Warlock joins the team, he sometimes shapechanges into vehicles that can transport the group. Professor Charles Xavier’s School for Gifted Youngsters in Salem Center, NY. Professor Xavier’s family fortune. All students are at Xavier’s School basically on scholarship, and this can sometimes include financial assistance to their families. Viper (Ophelia Sarkissian) and the Silver Samurai (Harada Keniuchio). S’ym (Illyana’s demon lieutenant in Limbo). The Demon Bear (a probable tool of the Adversary). Cloak (Tyrone Johnson) and Dagger (Tandy Bowen). None. Karma was missing and presumed dead during most of her time away from the team. As students at the Xavier’s School for Gifted Youngsters, they are under the responsibility of its headmaster – Professor Xavier. Various other adults share this responsibility to some extent. Dr. Moira MacTaggert helped recruit them, and Stevie Hunter was given charge of their physical education early on. They were also enrolled in her dance studio. Near the end of the period covered by this profile, Sharon Friedlander and Tom Corsi are added to the staff. Sharon serves as school nurse, and Tom seems to be a general caretaker. Even if their headmaster forbids them to take an active part in dangerous missions, he knows they need to be able to function as a team in times of trouble, and they therefore need a field leader. Initially Xavier appointed Karma, the oldest and most experienced of them, as leader. He also hired her as his assistant since he was reopening the school. After she was lost, Cannonball and Mirage came to share leadership. Cannonball’s strength is in the interpersonal relationships between the team members; he often functions as an understanding big brother. Mirage is considered (by herself and her teammates) their co-leader and “warchief” as she excels in field tactics. Xavier’s is also a regular school. So, along with their mutant training, the students follow a regular scholarly curriculum. They study basic maths and physics, English literature, computer use… much like regular high-school pupils. However, Xavier expects a bit more from his students. They tend to study more complicated subjects than their mundane counterparts. Like regular students, they’re assigned to write term papers… and it brings the same kind of stress when the deadlines approach. All members are young superhuman mutants. Even Warlock’s non-aggressive nature is sometimes considered a mutation of his alien species. X-Mansion’s academic facilities (the most spectacular being the Danger Room). UNSTABLE MOLECULES COSTUME [BODY 05, Cold Immunity: 01, Misc. Adv: Insta-Change]. The Unstable Molecules are a fabric patented by Reed Richards of The Fantastic Four. They are classic staples of the Marvel Universe. They adapt to the wearer’s powers rather than being damaged by them, allowing characters like Wolfsbane and Magma to keep their clothes on. It all began when the Brood, with the help of Deathbird, abducted the X-Men. The aliens wanted the mutants as hosts for their parasitic embryos. Professor Xavier was left behind, mourning the loss of his students. The X-Men were believed dead… or worse. The X-Mansion felt so big, inhabited only by Charles and Illyana Rasputin. Stevie Hunter visited, and Moira MacTaggert came from Scotland to see Charles, hoping to ease his grief and to convince him to start his school for mutants over again. Unfortunately, he was too lost in brooding to hear sensible arguments. Moira found a letter from Reed Richards while going through Xavier’s mail for him. It was a request to help Karma, a self-taught but powerful mutant in need of training. Reed Richards referred Karma, aka Xi’an Coy Manh, aka Shan, to Xavier after their encounter. During a party attended by the FF, Karma possessed Spider-Man (Peter Parker). She tried to use his powers to recover her young siblings from the clutches of her criminal uncle, Nguyen Ngoc Coy, and her brother Tranh, a mutant with powers similar to her own. In the process she fought and killed Tranh in self-defense. When Xavier declined to see Karma, Moira tried a reverse psychology tactic and went along with his decision. Surprised, Xavier asked Moira if she would teach Karma instead. Moira agreed that as a brilliant geneticist herself, and Xavier’s long-time partner in mutant research, she would be able to do a fair job of teaching young mutants. Then she presented other options for mutants to turn to: Magneto or Emma Frost’s Massachusetts Academy. Xavier reacted with outrage that she would turn a child over to such villains. Moira replied that it would give the girl her best chance to survive and master her abilities, the chance Moira’s own son Proteus never got. It worked. Charles reluctantly decided to meet with the girl, though he had not yet committed to becoming her teacher. It would later become known that Professor X had himself been impregnated with a Brood embryo: a queen. It subconsciously influenced Xavier to overcome his reluctance to continue the school. It favored the prospect of gathering powerful mutants to host its own progeny. Before Xavier’s scheduled meeting with Karma, Moira briefly returned to her home in Scotland. There she encountered a fanatical mob led by local priest Reverend Craig, a fundamentalist Scots Presbyterian clergyman. The mob was chasing a wolf which transformed before Moira’s eyes into a wolf/human hybrid. The were-creature then returned to its natural form, revealing a young 13-year-old girl named Rahne Sinclair. Rahne, an orphan and ward of the church, was a mutant. Her first transformation occurred in Reverend Craig’s presence. He considered it to be demonic, and the mob he led intended to burn her at the stake. Moira dispersed the mob, had herself named Rahne’s guardian, and took her to meet with Xavier and Karma. Xavier was still struggling with his grief and the fear of being responsible for the deaths of more students. Moira reminded him that the heart of his dream was not about mutant super-heroics. It was about giving hope to mutants who would be feared or exploited for powers they could not understand or control, and helping the world learn to accept them. Xavier finally agreed to reopen the school, with Xi’an and Rahne as the first students. Rahne would be called Wolfsbane. Then several mutant sightings occurred worldwide. But Charles Xavier was not the one to witness them. Donald Pierce, cyborg White Bishop of the Hellfire Club and enemy of the X-Men, discovered them. Pierce hated mutants and was plotting to overthrow the mutants leading the Hellfire Club. He began calling himself the White King and tracked these new mutants. He planned on destroying them or using them against other enemies, such as Xavier or the Hellfire Club’s Inner Circle. Danielle Moonstar, a proud young Cheyenne girl with mutant psionic powers, lived in the Colorado mountains where she fled after the uncontrollable manifestation of her abilities. Her (seemingly) deceased father was an old army friend and blood brother of Xavier’s, and her grandfather Black Eagle wrote to Professor X for help with his granddaughter. Xavier received Black Eagle’s letter moments after agreeing to reopen the school for Xi’an and Rahne. Moira, Karma, Wolfsbane, and Xavier arrived too late, after the old Cheyenne’s death at the hands of Pierce’s goons. But they were still in time to save Danielle from the Hellfire Club mercenaries. She joined forces with Xavier, if only to have her revenge on Pierce. She would be given the codename Psyche (later renamed Mirage). Xavier telepathically read the Hellfire mercenaries’ minds and learned of the other mutants Pierce had targeted. Roberto Da Costa, a talented young football (soccer) player, lived in Brazil. 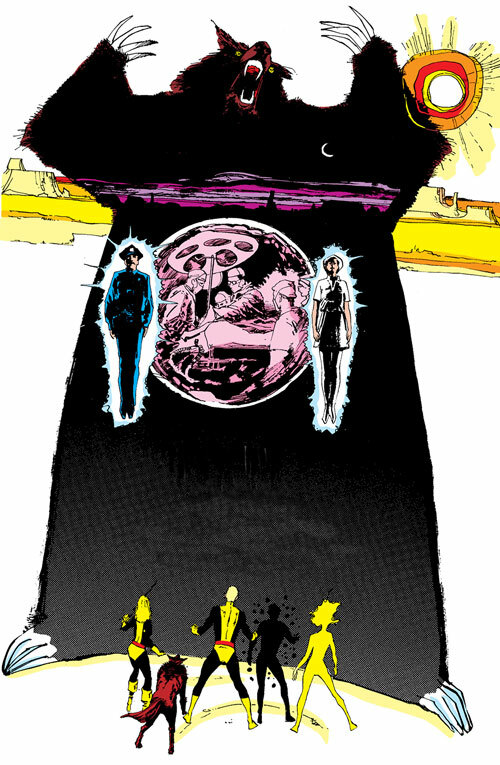 Pierce’s mutant detecting technology (which the Hellfire Club had based on Xavier’s Cerebro) detected the first manifestation of his powers, and Pierce had dispatched agents to kill him. Xavier sent Moira, Karma and Psyche to fetch him. They arrived after Pierce’s agents had kidnapped Roberto’s girlfriend Juliana and used her to bait Roberto into a trap. Karma and Psyche helped him, but during their attempted rescue, Juliana was killed by Pierce’s three bionic agents. These were the Hellfire mercs Reese, Cole, and Macon, who had been turned into cyborgs after being maimed in their first encounter with Wolverine. Roberto agreed to join the other mutants to avenge her death, not for Xavier’s teaching. He would be called Sunspot. Cameron County, Kentucky was the home of Samuel Guthrie. After his father’s death, he dropped out of high school to tend to his family (mother and 10 siblings). He took his father’s place at the coal mine. During a cave-in, his mutant powers awakened and he saved himself and another miner. Xavier and Wolfsbane went to contact him. Once more, Pierce beat Xavier to him. This time, he took advantage of Sam’s innocence and convinced him to join his ranks. Sam took part in Xavier’s capture, but when Pierce ordered Sam to kill, he refused. The rest of the teenagers came to the rescue and Pierce’s plan was foiled. Pierce had also moved directly against the rest of the Hellfire Club by kidnapping Tessa, aide to the Black King Sebastian Shaw. When Xavier and his students beat Pierce, they also rescued Tessa. She assured Xavier that he could leave Pierce to the Hellfire Club. The Inner Circle doesn’t take betrayal lightly. Pierce would be dealt with internally. Xavier, Moira, and his students departed to get medical help for Rahne, who was injured in the battle. Poor Sam was left behind. But Professor X convinced everybody that it was best for him to join the newly founded class. His codename was Cannonball. The five teens started their training. Their first ordeal was to survive an attack by the U.S. government. Henry Peter Gyrich, of the government’s secret Project Wideawake, had been monitoring these new mutants. He sent agents to kidnap them while they were shopping in Salem Center with Stevie Hunter. Michael Rossi, a covert agent and ally of Xavier, came to their rescue. 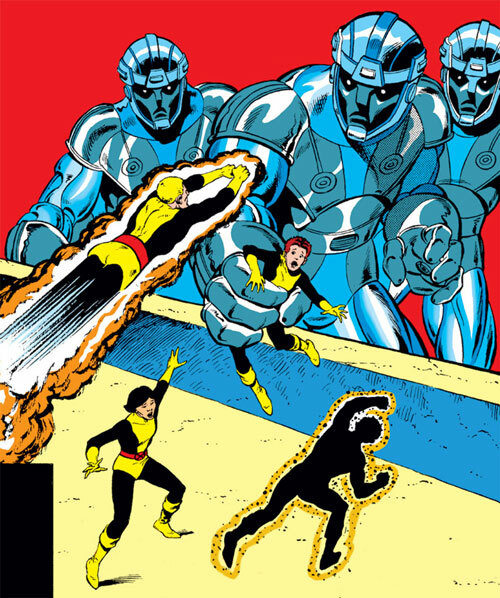 But the mutants were then attacked by Shaw Industries’ Mk IV Sentinels. These had been built for Project Wideawake but Gyrich had not intended to use them against teenagers. 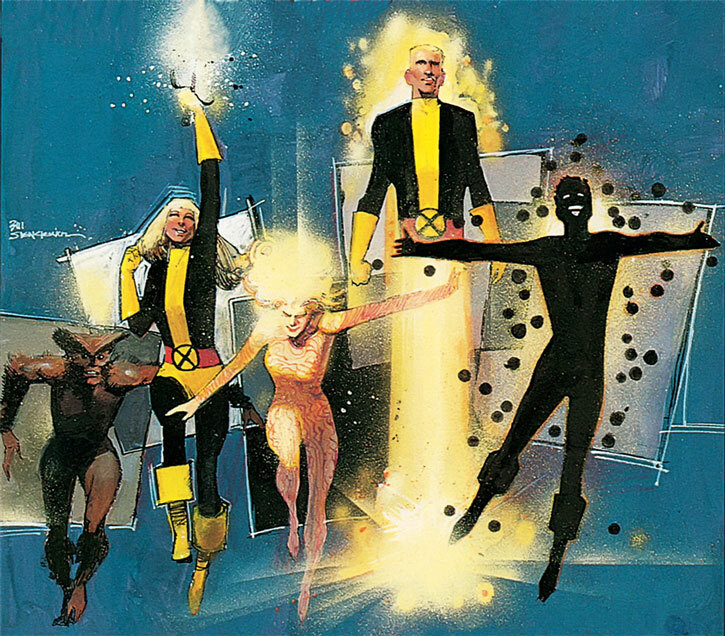 Sebastian Shaw activated them, hoping to make the New Mutants afraid of human authorities so that they would eventually accept sanctuary from the Hellfire Club. Michael Rossi helped them to escape capture and expose Gyrich. Meanwhile, the Brood queen embryo inside Xavier plotted against them. Psyche was the first victim. She had been afraid to take part in her first scheduled test in the Danger Room and now she felt like a coward. She desperately wanted to get over the fear, to prove herself and to show she could be as brave as her Cheyenne ancestors. So while her classmates were away at the shopping mall she trained alone in the Danger Room, despite Stevie and Xavier’s warning not to use it without adult supervision. Just as she was successfully completing her test, the Brood queen embryo made Xavier unconsciously reprogram the Danger Room for mortal danger, an X-Men level training sequence with safety interlocks disengaged. She was saved by the arrival of her classmates after they returned from the shopping mall. The Brood embryo would attack again, this time using Xavier’s telepathy to exploit Psyche’s image generation powers. The creature sent visions to terrify Psyche. She and some of her teammates feared she might be losing her mind. Then the creature created solid images by using its powers to augment hers, using her to create a solid Brood body for itself even though it hadn’t yet hatched. The New Mutants barely managed to halt the creature’s attack by knocking Psyche out so it couldn’t draw on her power. All the solid images it was generating, including its own body, vanished. But still neither the students nor Xavier realized that Xavier himself was the threat. That night the X-Men and Binary returned to Earth, after defeating the Brood infestation out in space. They knew Xavier carried an embryo. At first they were surprised to find the New Mutants in their mansion, and a brief fight occurred between X-Men and New Mutants as the teenagers tried to defend their teacher. The X-Men focused on neutralizing the embryo, which finally hatched. The matter was resolved. Charles received a new body cloned by Sikorsky, the Starjammers’ medic. Not only was he rid of the embryo, but his legs were not paralyzed anymore. It still took a long time for him to adjust to his newly restored walking capacity. At this time Kitty Pryde was still just 14. 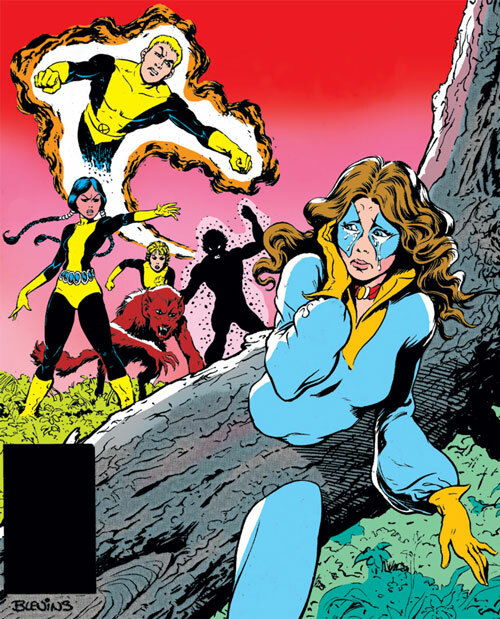 Professor X dictated that she had to leave the X-Men to join the younger New Mutants, who were supposed to be less exposed to danger while training with their powers. Kitty threw a childish tantrum, denying that this was the right decision. For a long time afterward, the New Mutants would resent her for the contempt she displayed towards them. 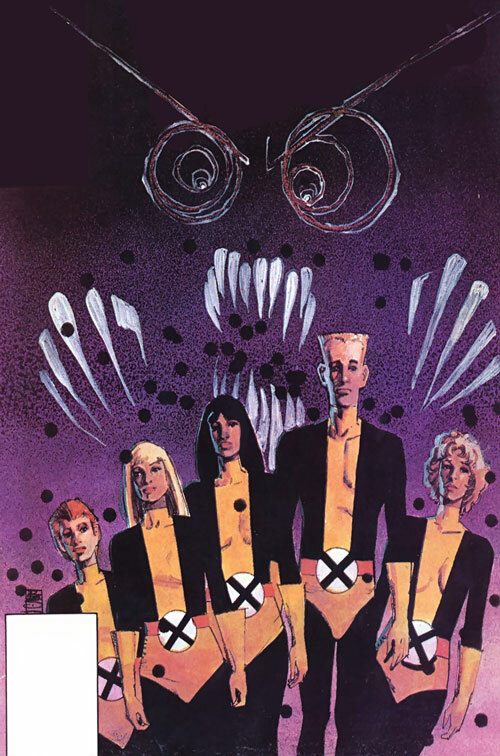 Xavier apologized to the New Mutants for the influence the Brood had on him. Together they decided that the New Mutants should continue. The students soon came to Xavier asking to help Stevie, who was being stalked. They discovered the stalker’s identity. He was a seemingly nice but disturbed lad from Stevie’s dance class. He desperately loved her. A victim of child abuse by his parents, he took refuge in this delusional romance. Thanks to the New Mutants he was able to get help. 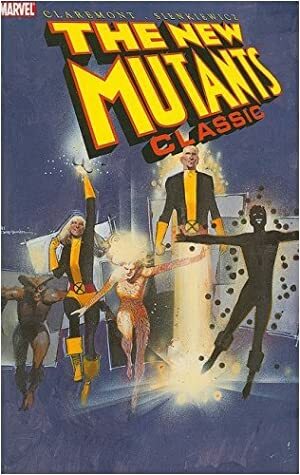 While the four younger New Mutants (excluding Karma) are visiting New York City, Wolfsbane and Sunspot get captured by a group of criminals trying to replicate the drugs that created Cloak and Dagger. Cannonball and Psyche team up with Spider-Man, Cloak, and Dagger to rescue them. They are too late to keep Rahne and Roberto from being dosed. The drug amplifies their powers and drives them berserk. Dagger is able to purge Rahne of the drug, and Cloak is able to cure Sunspot. But the process affects Cloak and Dagger, driving their own powers wild. Cloak and Dagger are seemingly able to cure each other. But a link has been created between the four of them. The New Mutants attended a fair with Stevie Hunter and saw Team America perform. Team America was a band of motorcycle showmen/stunt-men. They were mutants but did not realize it. Their ability was to possess an unsuspecting host and imbue that host with their combined strength and skills. The host became the Dark Rider aka the Marauder, the essence of the ultimate motorbike rider but also an electronics expert, master thief, skilled spy, skilled seemingly at everything. The Rider would appear whenever Team America was in danger, but they didn’t know ‘his’ secret. Viper, the former Madame Hydra, needed the Dark Rider to complete a bold robbery at an AIM facility. She assaulted Team America during the fair to lure the Rider into appearing. Team America unconsciously called upon their power and Danielle Moonstar became the unwilling host. Viper’s henchman, the Silver Samurai, kidnapped her. When Viper understood Dani was not truly the Dark Rider, she decided to use Moonstar as a hostage. She demanded Team America perform the robbery in exchange for her hostage’s life. While Team America debated what to do, Xavier made contact with them. He convinced them they were responsible for Danielle and must pretend to accept Viper’s deal. He started training them, both to help their mission succeed and to keep them from accidentally possessing others. The New Mutants were angry, feeling that this wasn’t the best way to save Danielle. While the operation started, Karma contacted her criminal uncle, Nguyen Ngoc Coy, to get the location of Viper’s base on the West Coast. In payment for the information, she agreed to serve him for a full year, like her brother did before she killed him. The New Mutants assaulted Viper’s hideout on their own, and prevailed. Before being defeated, the Viper and Silver Samurai teleported away and Viper detonated her last resort surprise. The New Mutants barely escaped the explosion with Dani, but not with Xi’an. The psychic link with Xavier was violently severed. Everybody thought Karma was dead. In California, mourning Shan’s death, Roberto was surprised to meet with his mother. She offered Roberto and his friends the opportunity to travel with her to Brazil and accompany her on an expedition into the Amazon Rainforest. Xavier pushed them to accept while he and the X-Men searched for Xi’an’s body. The New Mutants went to Roberto’s home in Rio de Janeiro. Things were tense between his parents. His mother was an archaeologist and an idealist. His father was an industrial baron, self-made, greedy and pragmatic. She wanted to study the cultures of the Amazon rainforest and to protect the region. He wanted his geologists to study and exploit the region for mineral resources. Emmanuel da Costa’s fortune and greed made him a potential recruit for the Inner Circle of the Hellfire Club. They lent him goons to scare off his wife and let him freely exploit these lands. For all the tension between him and his wife, he still cared for her, and wanted her safe if possible. Thanks to the New Mutants, the intimidation failed. This article is continued in The New Mutants – Year one, part #2 !